One’s first question may be, what the heck is an SSAC? 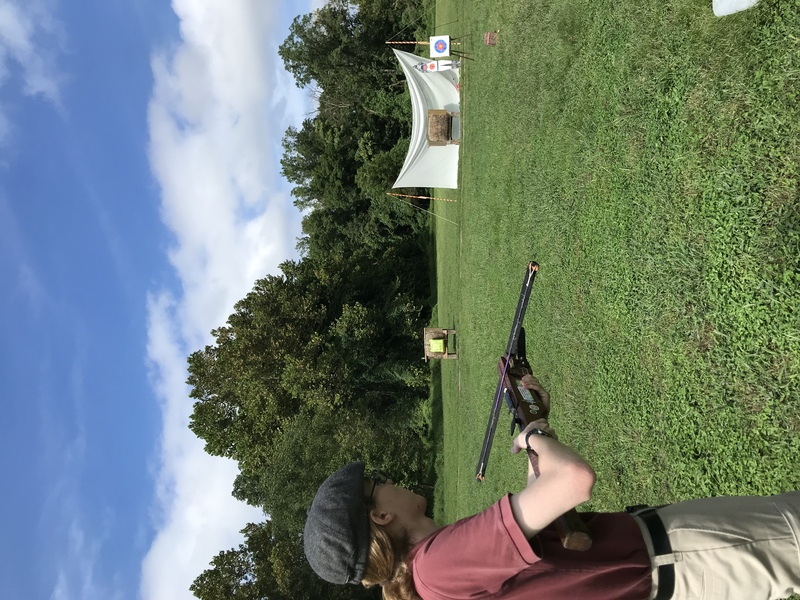 The Society Seasonal Archery Challenge, SSAC for short, is to provide more unique and continuously changing shoots which are still standardized such at every archer SCA wide is shooting the same competitions, for one season at a time. This idea was inspired by Atlantia”s Seasonal Challenge. The competition is sponsored by the Quivers & Quarrels, the SCA Archery Community. What makes this ever-changing, ongoing shoot so much fun is the departure from the norm. You may live somewhere where the targets you always see are Royal Rounds, not that there is anything wrong with that, but if you are looking for more diversity (or just something different), this is a ‘low barrier to entry’ option. The targets are generally easy to construct, or simply add different rules to existing targets. Some shoots, like the slots pictured above, can rely on a ‘mask’ in front of a standard or period target. Once you look at the sheer variety of shoots, it’s easy to see how this can be, and is a fun competition. Some of the shoots are based on period shoots as well. Look into the descriptions and conversations around them. At the time of writing, the shoot is ‘Lucky Target‘. For this one I had previously printed out targets at my local copy shop ‘MinuteMan Press’ and they were relatively cheap. As far as construction, and have some 3M spray adhesive and grabbed some random cardboard laying about. Sandwiched/laminated the paper target to the cardboard, and now this target can be pinned to any royal round or standard backer. Don’t have pins? Grab some wire hangers, clip them into two to four 4-6″ lengths. Twist one end into a ball with pliers, voila! For about $1.00-2.50 per target you will be bringing a whole new dynamic to your practice or event! Share this great event far and wide and if you think you have a great idea, you can share it! Simply e-mail Sir Jon and let him know! WoW Science Faire is here again! Come one come all to a good ol’ fashion’ Science Faire at War of the Wings! Dont get too serious friends, this is supposed to be fun! Can you show a process that was discovered in period? Show an invention of some kind that was in period? How dyes were made, pressed wine? It is all science and technology! This is supposed to be a lighthearted look at invention or technological advances. Think about a mundane science fair, this can be simple and fun. What you may consider pedestrian may be eye-opening. Can you display or otherwise show the process? This will be a judged competition. Criteria subject to change. But there may be points for ‘Wowwing’ the crowd! Reserve Saturday for dropping off/setting up your entry. Drop off and pickup times TBD. 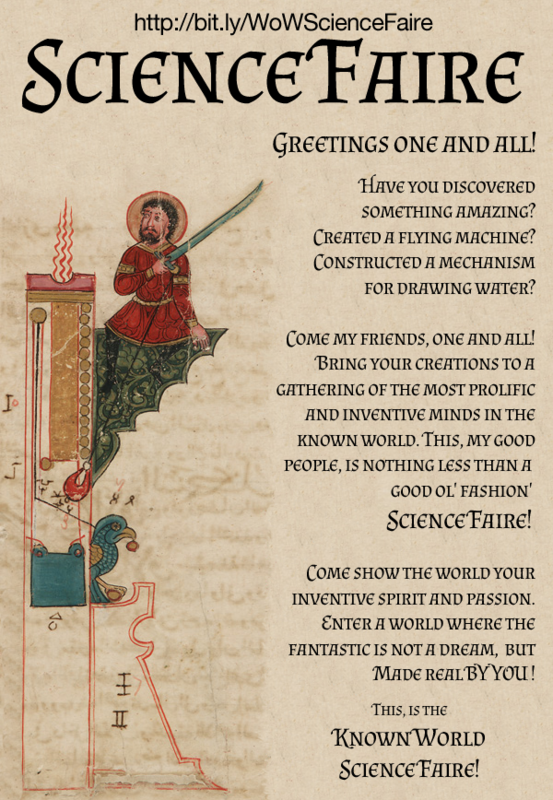 Please bring your wonderful ideas, contraptions, and inventive genius. Show the rest of the known world what the world had to offer in period! Even if you do not compete we invite you to bring anything you wish to share. Note: You do not have to compete to share! If you simply wish to share, make sure you add that to your description or as a note!